Wire Feed Welder is a semi-automatic or automatic machine, which is used in welding process. Wire Feed Welder uses one of the most popular processes of welding, which is known as Flux Coated Arc Welding. This method is most preferred over manual stick welding as it requires less equipment comprehension and provides a stronger joint compared to stick welding procedure. Also, it is a continuous welding process that allows you to weld nonstop throughout the day until you stop pressing the trigger button. Whenever someone wishes to purchase welding equipment, some questions pop into their mind like ‘which welding machine to purchase’ and ‘how to use a wire feed welder’. In this post, all your queries will be solved regarding wire feed welder. An individual, who is a beginner in welding, should always choose wire feed welder as their first welding equipment due to its compact design and user-friendly process. 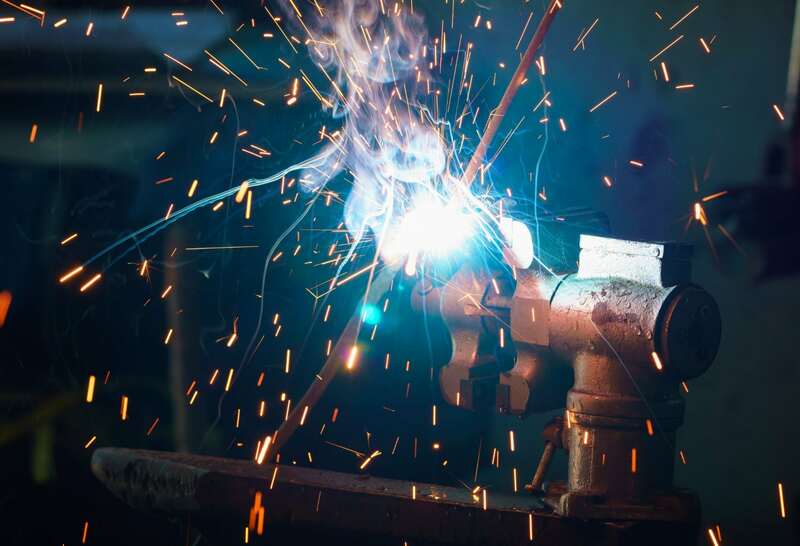 It is extremely simple to operate a wire feed welder as an operator can easily weld metals by pressing a button since all you need is an electric connection. Over and above that, it is also easy to maintain a wire welding machine, as you don’t have to change your electrode sticks each time. If you are a professional, then it will help you by reducing the time taken to make a weld. This means that you can complete more jobs in less time; thereby, enhancing your income. If you are a beginner, then you can easily adapt to its mechanism as you can make strong and durable welds by just pressing a trigger button. The grip of a wire feed welder is similar to holding a gun, which gives you a better grip over the equipment; hence, you can weld better than conventional methods. You don’t have to worry about the compatibility of the metals with the machine, as it can be used with any commercial metal. Weld created by wire feed welder will have a higher deposition rate as compared to other machines. People are frequently bothered with a question ‘how to execute wire feed welding’. However, in reality; wire feed welding is extremely simple as you require a proper wire, CO2 gas, and a welding machine. Next step is to keep your hands steady and let the machine do the job for you. Before you learn how to wire welding, you should carefully evaluate your welding requirements. Know the metals you wish to join together, and analyze the effect of welding on these metals. These things will help you in creating the best welding effect and make your welding area stronger. Before creating a weld on the actual product, make sure you practice weld on scrap. Once you are confident enough then switch to welding the actual product. This helps in ensuring that the resistance power and longevity of the weld is perfect. Make sure all the safety measures are followed; such as, cover your body with fireproof clothing, keep flammable substances away from the welding area, and keep the welding area dry and clean. Ensure that the machine leads are properly hooked into the electrode positive. Check whether the welding machine speed and voltage is set as per the correct requirement. If you are unsure of it then refer the manual or research more about metals and its properties. It provides a controlled rate of spark, which results in the safety and security of the user. Also, you can define the rate of welding as per the metals’ compatibility. Maintain a proper angle between 5 to 15 degrees to give an effective weld to your product. Wear a darkening helmet that will give you a perfect idea of the area to weld as the sparks coming out of the equipment may cause you to weld unwanted areas. Choose your wire carefully, as you will come across many different types of welding wires. If you are not sure then AWS ER70S-6 is one of the most commonly used welding wire for major types of welding needs. There are several varied choices available in the market when it comes to purchasing a wire feed welder. Innumerable brands specialize in making good quality wire feed welding; such as, Lincoln Wire Feed Welder, Miller Wire Feed Welder, Craftsman Wire Feed Welder, Century Wire Feed Welder, etc. These companies have a huge product line, which provides the users with the best welding equipment. The products created by these brands differ from each other in terms of size, price, and power requirement. Most of these companies provide users with a standard one year warranty on machinery and its parts. It is a compact wire feed welding machine, which is an appropriate product for an amateur or DIY craftsman. It is extremely lightweight and this feature makes it the best equipment for first-time users as they do not have a steady hand with welding machines. It is one of the most cost-effective welding machines available online, which makes it a must-buy for uses with a small budget. It features two different weld modes i.e. Sheet Metal and Thin Plate, which can be chosen depending on the job that needs to be done. It can work efficiently with two to ten-pound spools. You can also choose from ten different weld speed options, which will help you in completing the job quickly. The product is perfect for those who are extremely new to welding or are hobby welders; for instance, wanting to fix their lawns, etc. The machine features Gasless Flux Core Welding, which makes it ideal only for a handful of tasks. The machine overheats if kept running for longer hours, so a cool down period is required in order to use it again. Users who are looking for a sturdy and heavy duty machine should skip buying this one. It is an amazing product that is apt for beginners as you can buy it at affordable prices for accomplishing your welding needs. It is an extremely economically priced model of wire feed welding machine in the market as it is available for approximately $325 on various online stores. It is an ideal machine for fulfilling your home and small welding needs because it has a capacity of welding 1/8 inch mild steel. It can easily run on all indoor power units, as it requires a low power input of 115V. It is a lightweight machine that weighs around 46 lbs, which makes it extremely portable. Lincoln’s Handy MIG Welder K2185-1 is easy to use the product, which beginners should buy for fulfilling their welding needs. It has amazing control options and 4 preset voltage settings to use; so, people with basic welding needs should opt for K2185-1 Handy Welding Gun. It is not suited for professional welding needs as it has a lower voltage, due to which it overheats within no time. To overcome this problem, you have to wait for the machine to cool down before using it again. This machine will provide you with a unique combination of pure raw power, blended with lightning speed. Ensure that you use safety equipment when using the machine for heavy duty work as things may get messy if proper care is not taken. The machine is capable of welding 3/16 inch steel in a single pass, which makes it a perfect instrument for heavy-duty welding jobs. It features dual input power option i.e. 110 Volt and 230 Volt in just one plug. It also has 7 different voltage settings, which makes it ideal for precision welding jobs. It is a perfect machine for long hours of usage, as it features a heavy-duty motor, which makes it more dependable for enduring uses. It is best suited for versatile welders who like to weld different things at once. You can easily weld automobile parts and body, tractor, lawn, household welds, etc. by using this machine. Some users may find it to be an expensive one, in comparison with other basic welding machines. However, as it provides many more features than a basic welding machine, so it is definitely worth the price. The Spool Gun that is required to weld aluminum is not included with the machine. Requires more handling and care; hence, needs to be used by professional individuals who posses sound knowledge of welding equipment. It is a great machine that arrives with lots of useful gear, which makes it a recommended purchase for users with multi-buying needs. It comes with an add-on spool gun, standard MIG gun, protective mask, aluminum welding wires, solid wires, regulator and many more items. It is most suited for a wide range of tasks, as you can weld stainless steel, mild steel, aluminum and lots of other metals with ease and comfort. It is very easy to assemble and dismantle the machine. The entire assembly of the machine takes not more than 10 minutes. It has an inbuilt overload protection feature, which makes it more durable and preferred option for continuous or long-term welding requirements. Some buyers find the equipment to be a bit expensive, compared to the other products of the same features. However, you get lots of gears included with the machine; so, if you evaluate the entire package, the price is a real steal. It certainly is a handyman’s welder that makes it one of the best wire feed welder for fabrication jobs; but, it is not suited for heavy-duty production line work. Unlike other welding machines that work on both 110 Volts and 230 Volts, this machine works only on 230 Volt power input. First, evaluate your buying requirements; whether you are buying the machine for do it yourself projects, fabrication assignments, multiple jobs, single job, heavy duty production job, or anything else. Then, choose the ideal size of the product required, as the compact product provides the user with more flexibility and greater ease during usage. Check for features like overload protection in case the machine needs to be used for longer hours, as a machine without overload protection cannot be relied on for continuous welding. Choose a machine that provides different welding options along with diverse welding speed options to choose from, in case your requirement is of precision welding. Know your budget and plan your purchase accordingly. Also remember, cheaper and unbranded welding machines will not be as dependable in comparison with expensive and branded ones. To conclude, wire feed welder is an essential tool for all welders. Now that you know the pros and cons of top 4 wire feed welders that are available in the market, buy one instantly for fulfilling your welding requirements! Also, you may be interested to read everlast welders review and multi process welder reviews.